1 "The vision of Obadiah. Thus saith the Lord God concerning Edom; We have heard a rumour from the Lord, and an ambassador is sent among the heathen, Arise ye, and let us rise up against her in battle." 2 "Behold, I have made thee small among the heathen: thou art greatly despised. 3 ﻿The pride of thine heart hath deceived thee, thou that dwellest in the clefts of the rock, whose habitation is high; that saith in his heart, Who shall bring me down to the ground? 10 "﻿For thy violence against thy brother Jacob shame shall cover thee, and thou shalt be cut off for ever…11 In the day that thou stoodest on the other side, in the day that the strangers carried away captive his forces, and foreigners entered into his gates, and cast lots upon Jerusalem, even thou wast as one of them. 15 "For the day of the Lord is near upon all the heathen: ﻿as thou hast done, it shall be done unto thee: ﻿thy reward shall return upon thine own head. 16 For as ye have drunk upon my holy mountain, so shall all the heathen drink continually, yea, they shall drink, and they shall swallow down, and they shall be as though they had not been." 17 "But upon mount Zion shall be deliverance, and there shall be holiness; and the house of Jacob shall possess their possessions." Obadiah is fourth in the listing of the Old Testament Minor Prophets, and the shortest. Chronologically, it was possibly the earliest of the prophetic writings, written c. 840 B.C., though some commentators place the writing in the 6th century B.C. Obadiah means "worshipper of Jehovah." Mount Zion – Also Jerusalem. The place from which the Lord established His earthly Kingdom and restored the inheritance of His people. Edom – Also known as Esau. Twin brother of Jacob (Israel), sons of Isaac & Rebekah. ﻿Esau sold his birthright to Jacob for a bowl of porridge, and Jacob stole the ancestral blessing by deception, setting the stage for two nations in constant opposition. ‘Edom' refused to let the Israelites pass through its mountains to get to Canaan.﻿ David fought and won a battle against the Edomites when Saul first became king and they became servants to David (2 Samuel 8:14). ﻿﻿When Nebuchadnezzar destroyed Jerusalem in 586 B.C., Edom was a willing ally and stood by in derision as the people of Judah were plundered and exiled." “Gadara (Hebrew: גדרה‎, Gadʾara, or גדר, Gader; Greek: Γάδαρα Gádara) was situated in a defensible position on a ridge accessible to the east but protected by steep falls on the other three sides. It was well-watered, with access to the Ain Qais spring and cisterns. 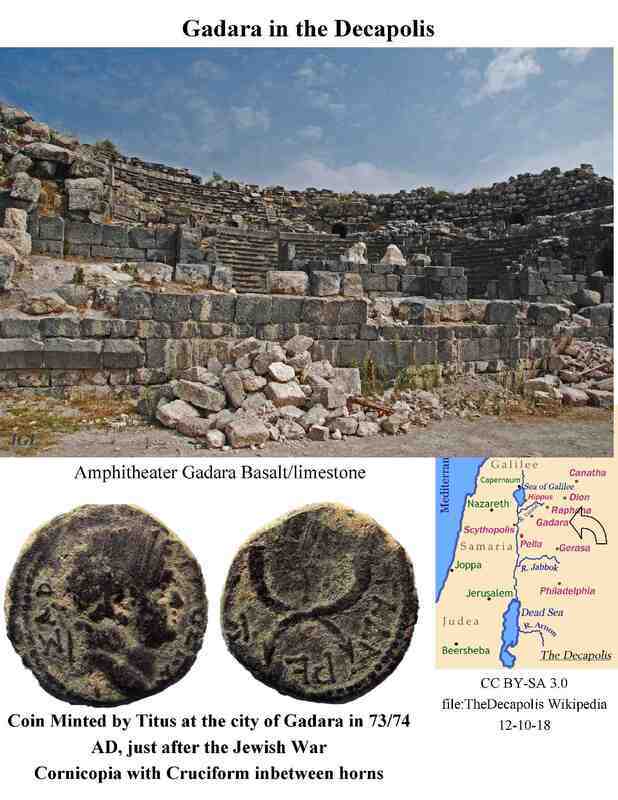 Further Sites like Capernaeum and Bethsaida can be viewed under the New Testament Related Artifacts tab.